You've just found or removed a tick from yourself or a pet. Your first thought may be to flush it down the toilet or to smash it. STOP! SAVE your tick! Identifying your tick is the first step towards securing your peace of mind. Next, TAKE A PICTURE. TAKE A PICTURE of your tick and EMAIL it to ticks@co.kendall.il.us. This email address routes directly to Kendall County Health Department Tick Program staff that can assist you in identifying your tick. Staff are familiar with local tick varieties and within 72 hours, they will send a response email identifying the tick. Please try to ensure that your picture is clear and shows as much detail as possible. The clearer the picture, the easier the tick will be to identify! Please note, if the tick was not collected in northeastern Illinois, we may not be able to identify it. 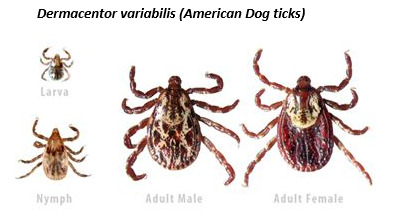 Identifying your tick correctly is crucial. 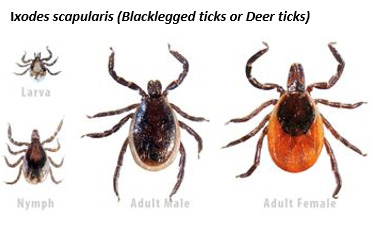 There are different life stages and different species of ticks, each with varying risk of carrying tickborne disease. Knowing what type of tick bit you, your loved ones, or your dog is a major step in Lyme disease prevention. 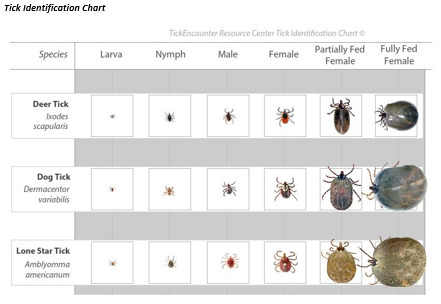 Take a look at the following tick identification guide to learn a little bit of what we look for. Once you have your tick identified, you are armed with essential information to share with your health care provider. The Kendall County Health Department cannot provide direct medical advice; however, we hope that information provided through this service can help you make the best decisions for your health. This department highly recommends consulting directly with your physician especially if it is confirmed that you were bitten by a Deer Tick, the tick capable of carrying Lyme Disease. For additional information on ticks please visit our tick webpage on our website at http://www.kendallhealth.org/environmental-health/ticks/ or contact our Environmental Health Services Division at 630-553-8026.